It looks like Trump-appointee Ajit Pai over at the FCC is setting his sights on unraveling regulations that guarantee net neutrality. This radical change would mark a reversal of strong net-neutrality protections put into place during the Obama administration by former FCC chairman Tom Wheeler. The history of how open Internet advocates won the first-round fight for net neutrality and defeated paid prioritization is revealing. After initial missteps in 2014, when Wheeler’s proposal to allow companies like Comcast, AT&T, and Verizon to create pay-to-play fast lanes caused massive online protests and pushback from the tech industry, the future of the open Internet seemed assured. At the time, open-Internet advocates cheered Wheeler on when he reversed course and decided to base net-neutrality rules on Title II of the Communications Act of 1939. How times have changed. The Trump administration is engaged in a frenzied destruction of a host of Obama-era regulatory protections. It looks like net neutrality may be next on the list. It’s been reported that FCC Chairman Pai has been huddling with telecom lobbyists representing AT&T, Comcast, Charter, Sprint, Verizon, and T-Mobile. These meetings and Pai’s statements to the press seem to be signaling that the chairman is setting the stage for a policy shift that would favor the bottom line of the telecom giants over the interests of everyone else—meaning the interests of every other sector in the economy. In lock step with the broadband industry, Pai has consistently stated his dissatisfaction with the Title II designation, which classifies broadband companies as utilities and subjects them to utility-like regulation. The issue of net neutrality is the fight that won’t go away. After all, we now live in a world where literally everything depends on affordable, open access to Internet service. The players and the stakes are high. The fight for open access pits the telecom giants in a struggle with the tech industry and the public at large. What is net neutrality and why does it inspire such passion? Net neutrality is the principle that the Internet should remain a level playing field for all users. Net neutrality preserves the rights of all users to communicate freely online, and net neutrality has been the engine for fostering a new and robust online marketplace. Who benefits from net neutrality? The answer is everyone and everything except the Internet service providers. Net neutrality fosters job growth, competition, and innovation. It’s essential for small-business owners, online retailers, entrepreneurs, and startups, for online job sites, streaming entertainment providers, free-speech advocates, students, and political, social, and arts groups that lack access to mainstream media. When it passed rules to protect net neutrality, the Obama administration was hardly a radical outlier in understanding the economic, social, and political benefits of an open Internet. 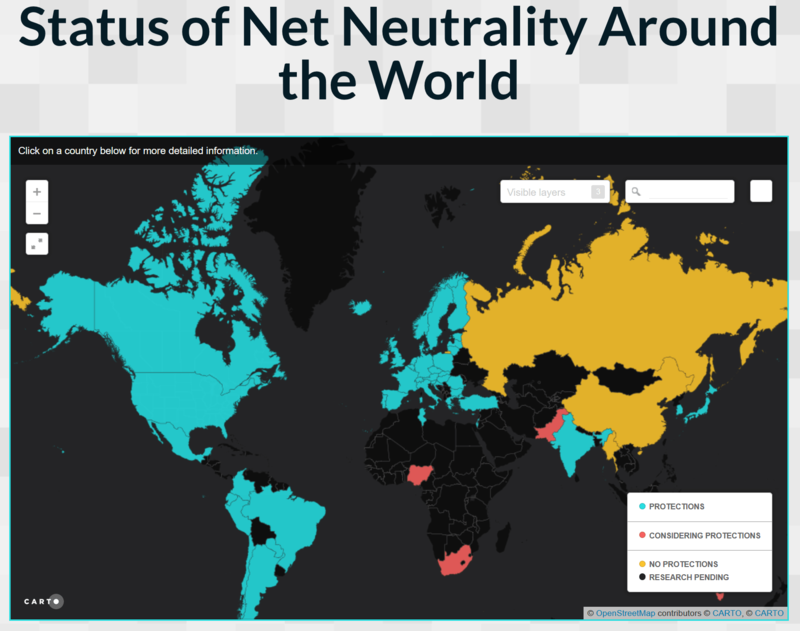 As you can see in the map below, the rest of the connected world understands as well—the exceptions being Russia and China where suppression of free speech is the norm, and net neutrality threatens government control of political dissent. What happens if the service providers win this round and we lose net neutrality? Here’s a short list of what could happen, and it’s pretty grim. Open access would disappear, and innovation would be stymied. Free speech could be curtailed. Cable and phone companies could create Internet fast and slow lanes and slow down or block Internet traffic as they choose. The fast- and slow-lane system would effectively create online winners and losers. Extra charges could be levied to content companies that could afford to pay for faster speeds and preferential access, thus limiting competition. Those extra charges would be passed on to all of us, and the cost of Internet service would increase for consumers and small businesses. Internet service providers could slow down competitors’ content and block political or social opinions the provider might disagree with. So get ready everyone. Round two is about to begin. Previous Post:Sean Spicer: Holocaust denier?